“THE ISLE OF CLOUDS, EMBRACING PRESERVATION OF CULTUREâ. The Bequia Onshore Activities Management Committee (BOAMC), with the support of the Ministry of Tourism, Sports and Culture, was established in 2015. As a community-based, non-profit organization, the committee takes as its responsibility, the synergetic coordination and facilitation of events/activities on Bequia for the mutual benefit of all. Its ambition is to improve services, ensure equality of access for all its diverse communities, and improve the quality of life of all by encouraging people to be involved fully in the economic, spiritual, cultural and social life of Bequia and to ensure fairness and balance to all concerned. 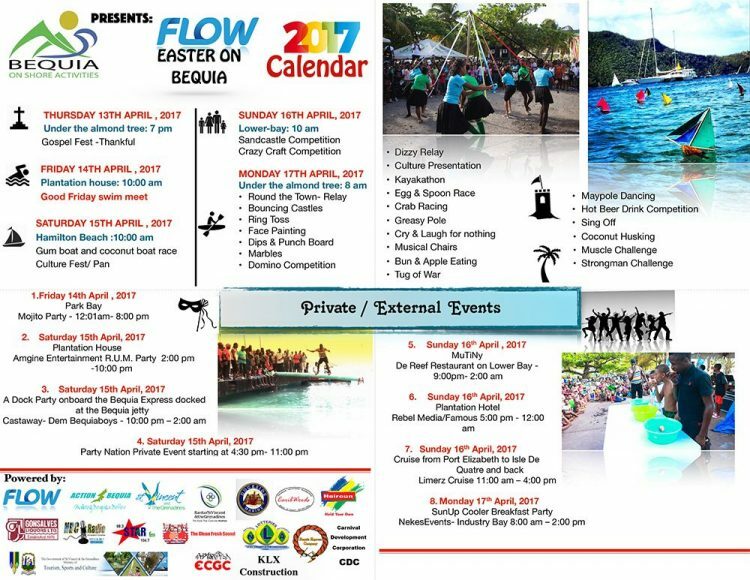 As per our mandate, the committee is pleased to present the Bequia Easter On-Shore Calendar of Activities for 2017 under the theme “The Isle of Clouds, embracing preservation of cultureâ. No alcohol is permitted at this event and the no bottle policy is in effect. According to law, alcohol and amplify music are strictly prohibited. 3. Shuttle service can be arranged from the harbour and from the top of the lower bay hill into lower bay and back. 3. The road between the bistro and the intersection at the almond tree will be close to all vehicular traffic. 4. Vending is not allowed between the bistro and the bus stop. 5. Vending will be in designated areas. 6. Vendors must have all necessary permits and license. 7. All vendors must apply to the district council for a spot to vend and pay the clean-up fee. 8. Vendors must adhere to the no bottle policy. 9. The parking area north of the bus shed is designated taxi parking. The BOAMC not only serves as a platform for the preservation of the Bequia Community Values, Culture and Identity but also, an efficacious conduit for enhancing the Quality of Life of all citizens of Bequia. In other words, this Committee serves in the best interest of all of Bequia, both residents and visitors and not the selfish agenda of any group of persons or entity.